Share the same library in a group via network or the internet. 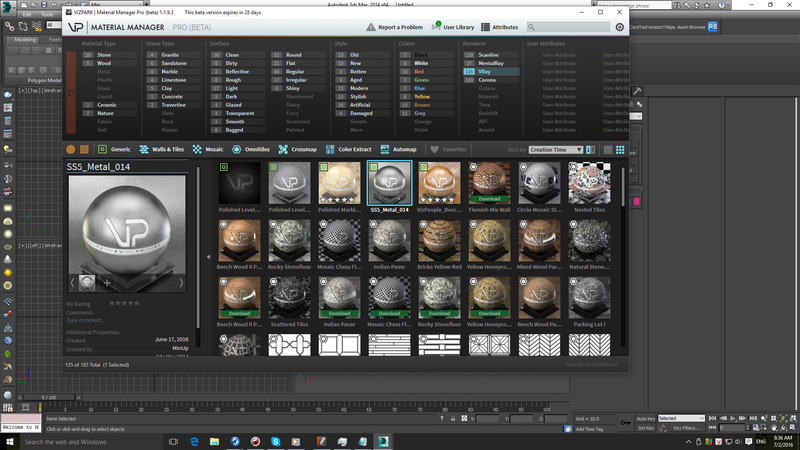 Integrate Material Manager into a studio pipeline with Maxscript. Connect with the online User Library, download over 160 materials for free and share your own materials and maps with others. The VP MATERIAL MANAGER is a new innovative tool to manage materials, maps and bitmaps within 3DS MAX® in ways never possible before. Material presets can now have ATTRIBUTES that can easily be filtered with the integrated attribute filters. The times are over where you needed to dive through folders to find the material you need. Just select the combination of attributes and the preset manager will show you the materials that fit these attributes. Finding materials was really never faster! Gone are the times when loading materials resulted in lost or non-assigned bitmaps where you had to find and re-assign the bitmaps manually. Among these main benefits, MATERIAL MANAGER has much more to offer. You can use the wild-card search with instant results that a blazingly fast, change and edit attributes, add comments, rate presets, create favorites and many more. 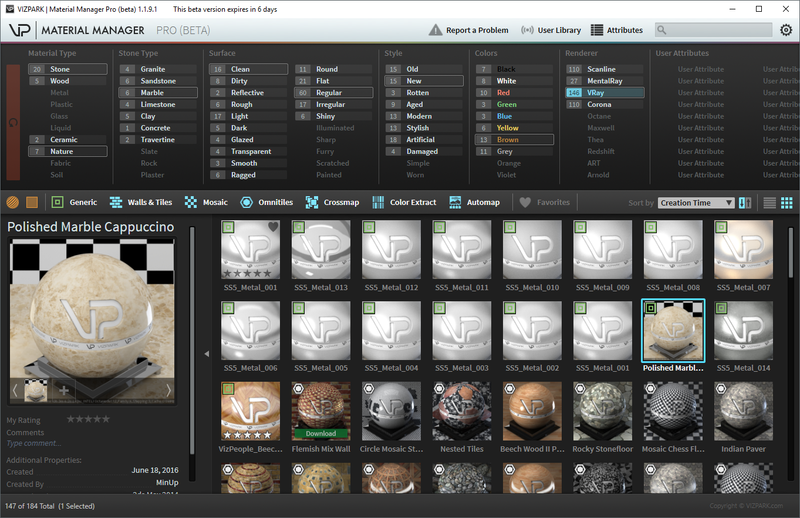 MATERIAL MANAGER is integrated directly into the VP Plugins with buttons for loading and saving presets. This way you don´t have to bother creating a new material or re-assigning a material to an object, just load a different preset and watch the result. If you are looking for a material or map preset, you don´t want to waste time searching through several material libraries. The ATTRIBUTES section of Material Manager makes finding presets a breeze. Just click the attributes that describe the characteristics of your material and you´ll only see the results that fit. Filter by COLOR, TYPE, MAP OR MATERIAL, and even search live by just typing in the search field. One preview thumbnail might not be enough and waiting for a preview to be rendered can also be annoying. With Material Manager, you can assign up to 5 preview images per preset, which can be enlarged for better viewing. Material Manager offers two methods of importing presets and one option to export presets. You can import 3Ds Max .mat libraries and automatically render thumbnails for each of the presets. You can also export self-contained presets including the bitmaps for better exchange with colleagues or other artists. Just use the proprietary format .mmp to export one or more presets and import in Material Manager. The online User Library provides a growing repository of shared materials and maps by other users and VIZPARK. Materials can be uploaded and downloaded with the Material Manager 1.1 LE which is included in the installation. To download or upload and share presets, a valid VP User account is required. If you are using any VIZPARK Plugin, you can upload and share your own materials and maps in the User Library with the Material Manager. Every approved preset will earn you between 5-15 Euros which will be added to your Loyalty Rewards balance for future purchases. 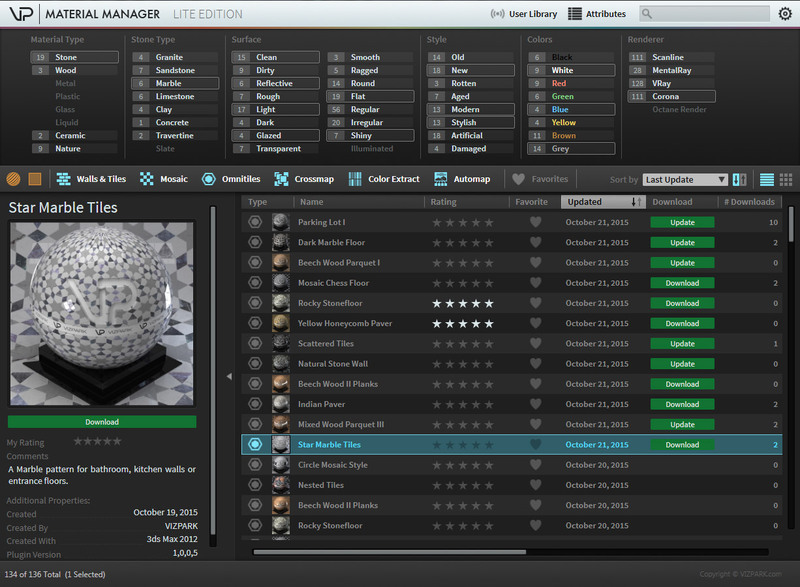 There are two versions of the Material Manager, the Lite Edition and the Pro Edition. The Lite Edition is a FREE add-on for all VP Plugins and includes material presets specifically made for our plugins. 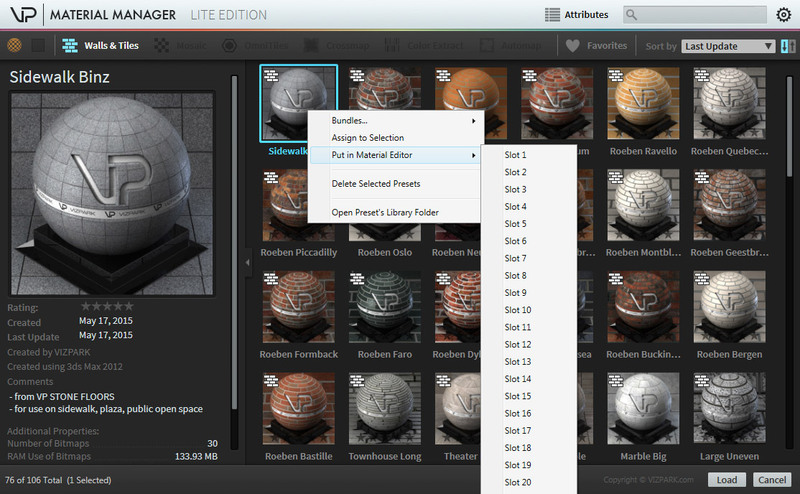 The Lite Edition is though LIMITED to only load, save and manage presets from our own material and map plugins. 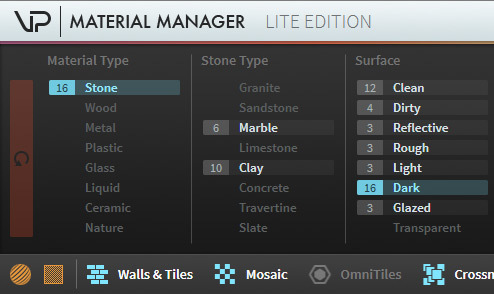 MATERIAL MANAGER Lite Edition is included with the purchase of Walls & Tiles, Crossmap and Mosaic or Omnitiles. All Material and Map types? Try out the 15 day Pro version or buy the full version. There are two options, monthly subscription or perpetual license. The perpetual license is included in PLUGIN Complete and VP COMPLETE for 3Ds Max / GrowFX. Option to keep maps stored in their original location (when saving new presets). A crash when scrolling enlarged previews quickly. Importing .mmp files of presets without thumbnail. A crash when changing search text rapidly. Changing sort order would not refresh preset list. Crash when right clicking on an empty area. A crash in DBMerger.exe in some situations. Crashes while saving in the German version of 3ds Max. KNOWN ISSUE: The original 3ds Max 2019 (pre updates) introduced a bug that limits Material Manager's load/save functionality. This issue is fixed in the first 3ds Max 2019.1 update. [PRO] Fixed preset validation before uploading. You now have to select at least 5 attributes that are not user attributes to be able to upload. KNOWN ISSUE: Thea render doesn’t seem to stop rendering the thumbnail. Email address with hyphen (-) in it would not allow to click the send button in the bug report dialog (Pro version only). Fixed an issue with the database preparation script. ENHANCEMENT: VPMM-89 – Hide X button in search field when search field is empty. This 9 min. video shows how to install Material Manager (Pro) and how to set up the macro buttons in 3Ds Max. It also shows the difference of the Lite Edition and Pro version, and the first steps for a quick start. This video is a short demonstration of how presets are loaded and saved with VP Material Manager. It shows how to load entire materials with Walls & Tiles and how to switch color sets with VP Color Extract. This video explains how to add custom thumbnail previews for each preset, how to add multiple previews and how to create and switch to customized thumbnail scenes. This video shows how to efficiently use the attribute filters, create your own User Attributes, use comments and search and the additional previews to manage presets efficiently and organize in better ways. This 8 min. video explains how you can find and change the library location for the Material Manager (Pro) library. You´ll learn which files to move (and which not to move) and which preferences settings to change in Material Manager. The MATERIAL MANAGER online reference guide includes a detailed description of Material Manager, it´s installation, usage and configuration. What is the difference between LE and PRO ? There are two main differences: 1) PRO can handle all materials that 3Ds Max can handle, while LE only handles presets from VIZPARK plugins. 2) LE is free with all VIZPARK plugins while PRO is a commercial (paid) product. Each purchase of one subscription or perpetual license comes with 1 (one) license. The license needs to be activated on your workstation with an online connection to the VIZPARK website (required). Perpetual means permanent, so you have an unlimited license. Subscription means you buy / rent Material Manager on a monthly basis that requires renewal every month after your purchase. The demo version is limited to 15 days after which you won´t be able to use Material Manager anymore. This license is called “time limited license” and you have to buy a subscription or perpetual license after the demo time-limited license has expired. The Subscription Studio Bundle includes 5 licenses per month at 20% discount. The Perpetual Studio Bundle includes 5 permanent licenses at 20% discount. Unlike other manufacturers we don´t ask for a 12-month prepayment. You can buy one month of subscription, then cancel and get back to a subscription anytime later if you like. The minimum time-unit for subscription is month. The material manager is fantastic! Our only reservation as a studio for not moving forward with it in our pipeline, is that we cannot control the directories for the material’s maps. Once Material Manager allows you to maintain the original directories for the maps in a material, this will be an easy purchase! if you use other vizpark plugins, this editor will make it easier for you to work and exchange your libraries with those shared by other vizpark users. The product is good, I like it very much!Have time to study hard! 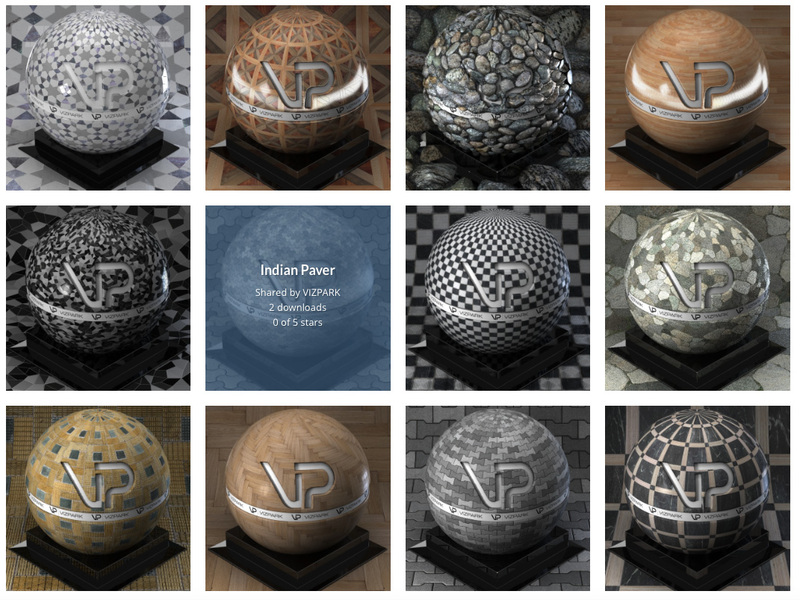 Yes, some of the materials are VIZPARK plugin materials of Walls & Tiles, Omnitiles or other plugins from us. You can download our full featured demo versions of each plugin to use these materials and if you want to use them longer than the trial period of 15 days, you need to purchase a license of the plugin. Until then they are free. Let me know if you have further questions. Just curious, are images under CC0 – Public Domain acceptable to use in materials for submission? Good question! Yes, that would be fine. I´d say you should include the info in the comment field then that the bitmaps are license using the creative commons Zero license. Thanks! My studio has been using this product since it entered open beta, and we have been continually impressed with it’s quality. We use it in the teamwork mode within our studio to allow all of our artists collaborate on an easy to use and powerful material library. When my studio had issues getting the teamwork mode to work on our setup, the customer service provided us with a custom solution tailored to our studio. Thanks again VizPark! This is an excellent plugin in the 3d industry. Day by day it is improving. good luck for the viz park team. This will bring a revolution in the work field. The tutorials can be more friendly to the beginners. the video seems to me is made for the professional users. I am not a professional user. I only do this for my own project. So, i am afraid of the tutorials. Although the team is very helpful with their attitude. Thanks again for their help. Finally published the material manager. which contains materials for 3d max. Now you can easily select and set the material on the object. For 3d max is a big plus and also for specialists in the visualization. Best regards, Mirambek / architect. hello !! , PS: when the pro version will be ready ? We´ll be releasing the PRO version very soon, even this month. I want to evaluate this before potentially presenting it to my group, and I want to be able to use it on our network. My problem is that we already have a sorted texture library on our server and I would like to keep all the textures in that location. Would it be possible to save materials to the library without copying the textures? Ok, thank you. It’s a pity, we won’t be able to use it as it is now, but I’ll check back in a while. Currently Material Manager copies all of the textures to a central library location that is required for the database. So unfortunately it does not let you keep the textures where they are at the moment. This behavior was by design because in many cases textures are spread all over and we believe that keeping all in one place by default keeps them organized. I understand your point though and we will think about adding this option to Material Manager later. Product that should be included by default. Easy to learn and create material libraries. Great substitution for Adobe Bridge, but i am wondering – is it also possible to create such manager for 3D models. You must try this out.It is a must! I love this manager. I use it every day on every project. I cannot say how many times it has helped me already. You will love it too! Hi guys. We plan to use the same material library for several users. All the materials i’ve made and saved in the material manager are in a library on our server. Now some of the other guys wants to use that library and is it possible to just point to that location in their version of material manager or do i have to export every material to a .mmp format for them to import? You can use the same library with multiple users. In this case, since you already got a Material Manager installation with some saved materials, you need to keep them. Now, since you already got the library on the server, you just need to make sure the DB is also located somewhere on the server, where it is accessible and readable/writeable by all the users that are going to use it. Then, you just need to install Material Manager Pro on all the machines that you want to use it with, and during installation, choose team-work mode, then point to the DB location on the server, and to the library location on the server. If you already have Material Manager installed in stand-alone mode on those machines, you need to first uninstall Material Manager, then reinstall as described above. Hope this helps. If you need further help, please also consider submitting a support ticket. It’s a great one even in beta stage, hope to see more features such as saving all materials to library, or import other materials library(sigershader, evermotion, or even third party application, etc). It would b better if it can create a base materials of something complex or anything that would save ton of times. This is great product, I love it. Tnx vizpark for saving time with this product. Nice look, Easy using.But it’s already out of use. What a plugin. Nothing else to say but wow!!! – Could .mat files save modifiers such as noise, Corona displace etc? – User attributes under each section instead of on their own so I can add under Material type, Stone type etc. – Option to create folder of materials with their name instead of 4c30359a-a648-4a37-a972-6909ac2b7434 for e.g. great will look forward for it…. Thanks for your positive review! Unfortunately we can´t make Material Manager PRO free, since the development took very long and we spent money and time into this product to make it as good as possible. We will try to find a pricing that will work for anyone hopefully. If you are looking for a tool to manager presets from our Plugins, you might want to try the FREE Material Manager LE that comes with our plugins. very good software. Now I can organize all my textures in one software. 4 Stars with me, great plugin! I am finding 1 plugin can help me manager my material library. I found VizPark Material Manager. It’s hard to use at start. When I use it in several day, I love it. But It have some bug ( I emailed before). I hope this plugin will release as soon as with perfect work. I have a small error about gerenate thumbnail image, please see image. It is too large! I have been using 3ds max for a couple of years now. It the material browser in max is good but VizPark Material Manager is the best. Only improvements (for a 5 star rating): away to open Material Manager with one click (so another toolbar button). Also more attributes in the Material Type (Leather, Mosaic, Carpaint, Generic Paint, Parquet, Wood – I know I can set up my own attributes but it would be nice to have all of the material type attributes in one place). This is great product, I love it. Tnx vizpark for saving time with this product. Nice look, Easy using. Finally all necessary functions are implemented. Great Product – Congrats !!!! Still loving this plugin! Need a little help though to understand why i cant render my scene (not the thumpnails) with the vray framebuffer and only the 3ds max framebuffer when using materials loaded from this plugin? Am I missing a setting somewhere? It appears that when i render thumbnails for the materials, vray switches off the vrays builtin framebuffer when i return to render the scene. In the vray quick settings the builtin framebuffer is ticked on though. Sometimes it helps to close and reopen both the framebuffer and vray quicksettings – then i can use vfb again. I might become an annoying issue if I have a big scene to load everytime a want to render. Anyway the plugin is freaking awesome! Did you check if the vray framebuffer is being deactivated in the render settings ? If that´s the case, you need to turn it on again. We are not aware of anything like our Material Manager preventing normal rendering from using the vray framebuffer. Works great with other VP plugins.Best solution if you work with multiple files. “Must have” plug-in for quick render setup Good job! how are we gonne download this, i am gonne be crazy why it is so hard? and its free wre is this download button? It´s not hard to download. Just use the “add to cart” button. The product is currently free, so you only have to fill in the details for the checkout and you´ll receive a download link. We are asking to provide your details because we want to know who is using our products, as this helps us to provide better support and improve the products. I like this think. The work is faster a lot. I have been using 3ds Max for years now. I am not an expert user, but I do get around. I am obsessed with plugins and being as productive as possible. I want to say that this is the only Material Manager on the web that is worth it. When the Beta Phase will be over I do hope that the plugin will not so expensive that I will go back to my old workflow. Keep it up it is a very very useful plugin! Very usefull tool, thanks a lot for that. My recommendation for other users of 3dsmax to try it. This looks really great! when you write: “MATERIAL MANAGER stores the bitmaps in a central library database to ensure that bitmaps are found when materials are loaded” – does it mean that the library with bitmaps can be placed on a render slave and all the Guys in the office can access it and do dbr (if they each have a license of course:-))? Yes, the central library can be stored on a network location, so that the materials and bitmaps can be used in network rendering. This is working already. We are planning a workgroup feature for the final release version that will allow multi-user environments where all users can work with the same material database (but with different user names and settings). This workgroup feature is not implemented yet but will be the next we will work on. What is the final cost of this product? Will there be a way to bulk import materials and render previews? Will we be able to add our own custom tags? 1) We haven´t defined the cost for the final product yet, since the final feature set is not fixed. We think about two options, one subscription based version and one with a perpetual license. Not sure yet though. It also depends on how important the Online User Library feature will be be for our customers. the ability to add my own tags would be a benefit. The first material I imported was a cloth shader and İ quickly found that there was not Cloth tag. İt would be great not to limited to the preset tags. Further, it is unclear what the cost of this product would be on release. Thus, I am unwilling to start to integrate it into my work flow without some idea of final cost. An idea of cost would be welcome as soon as that is decided. Thanks for you rapid reply. Congratulations on thinking of everything a user might need. I cant wait for the final product! For exactly this kind of feedback we have made Material Manater Pro a free beta version, so we can collect information and release a version that will be what you and others really need. The custom user tags / attributes will be in the final Pro version and the missing current attributes are a result of the Material Manager having been a free addon for our own plugins (Walls & Tiles, Omnitiles etc.). Cloth and other attributes are definitely missing and we might add them as standard attribues as well. For sure you´ll be able to set your own attributes. Meanwhile, you can also add comments and search / filter by comments. That might help until user attributes are available. This looks like a very promising product; could be superior to other solutions to this problem available. However, there seems to be no way to bulk import and render materials. I already have a large materials library and I am not sure I would switch without the ability to import all or portions of my library at the same time. Adding my materials one at a time would be a long and painful process. There also doesn’t seems to be an option to import materials and then render previews later. Thanks. Once these are integrated, this product will be indispensable. Hi Matthew, thanks for your good review and the comments. You have addressed the most important features that we are planning. The next update will most likely have batch import of .mat libraries (so you can import your own materials more easily) and re-rendering of thumbnails (so you can render thumbnails of your imported presets overnight for example). These have been on our todo list for very long and finally these features are being worked on right now. the material manager is a very good piece of software. I love how simple it is but it can be made better. for instance the manager doesn’t seem to remember my last setup for it. for example if I filter the materials displayed using a set of settings these settings will be reset the next time I run the manager. Thanks, that´s a very good suggestion. Can you please submit a feedback through Material Manager (top feedback button in the header) for this ? It looks like a very good tool so far. Very good if you have a huge material library and you want to manage it quickly and easily. I’ll be willing to give it a try with my projects. It looks like much effort has been put into it ! I love this product. I started using 3DsMax recently and allways wondered why it didn´t come with something like this already included. Thank you. I love this thing. I haven’t seen a better manager and have been waiting someone to put something out there where I can download mats directly to a library. I can’t wait for the official release. Thanks for your positive feedback! We´re about to release another beta update soon with some nice further enhancements. Please feel free to submit your ideas / requests through the Feedback form that you can find on the top header of Material Manager Pro beta. How do I download Material Manager? I can´t find it. You need to use the “add to cart” button on top of the page, then go through the checkout and you´ll see the download link. You´ll also receive an email with the download link. it’s simple and looks good. excellent categorization. Thanks for your feedback and positive review! The attributes will get a make-over for the pro version, so we´ll gladly consider your suggestion for the concrete attribute. With new beta, all problems I have solved. The wonderful thing is, you can save your material preset with one click, with a render-preview. That is better than other. But It needs more more more material library. I think it will be posssible when out. I had a chance to try out the Material Manager Pro plugin. For me it is a much better option than the lite version because I am currently using the 3DSmax mental ray renderer, which limits the plugins I am able to use from VIZPARK at this time. The Pro version allows me to save presets for standard materials that I create into the material manager. The day of having to remake materials is outdated. It works with crossmap (supports Mental Ray) and I am very happy about that.